Shop employee Luke Murphy just completed a grand #bikepcking adventure! He rode his bike from his house in Glenwood Springs to Durango following the Colorado trail. Luke made it back to his truck in Durango after 10 days of riding, covering 414 miles with 44,753 feet of climbing. Scroll to the bottom of the page for Luke's Comprehensive Gear List. And he is off! The journey begins in Glenwood Springs. "Day one was a long one because of the ride up the valley. I started riding from the house at 8:45. I rode 52 miles with 5,700 feet of elevation gain. I rode up the Rio Grande trail to the roundabout and then up Castle Creek road to Little Annie road. I am camped on Richmond Ridge a few miles behind the Sundeck at 11,300 feet. I stopped riding at 5:00pm. Almost at Castle Creek road. Now comes the climb up Little Annie to Richmond ridge! I don't have the energy to ride to Taylor lake because it is 6 miles down the ridge. The only water here is a mud puddle. I am letting the water settle in my bottles. Hopefully I can wait until morning to drink the muddy water. I had 2.5 liters when I stopped riding. "I have arrived in Crested Butte! Today I rode 34 miles with 4000 feet of elevation gain but it was all straight up and down and at high elevation. I crossed Taylor Pass (12,200) and Star Pass (12,300). The views were tremendous. I saw 7 other bikepackers on top of Star pass. They did get a picture of me on top of the pass. 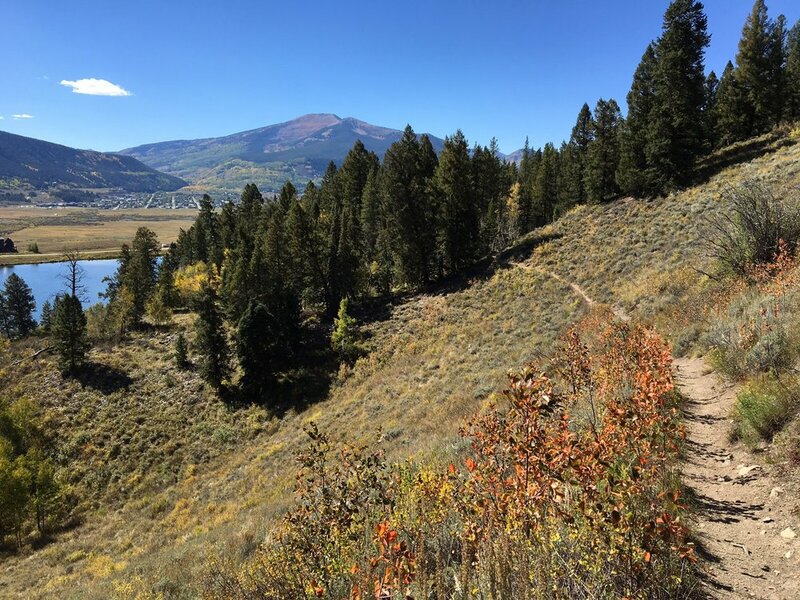 "I had a great time in Crested Butte visiting with friends and family who live there. I got back on the road today at 1:00 pm. There is so much to see and do in Crested Butte and my wife Kearstin came over for the weekend. Kearstin rode the first 7 miles of the route with me before returning to town and driving home. We rode South on Highway 135 for 6 miles and then turned on to Cement Creek road, which I followed to Italian Creek Road. This jeep trail quickly climbed to 11,150 feet. I then took a delightful 3.3 mile singletrack (trail 422) to Spring Creek Reservior and road 748. I rode as far as I could on this road until I only had an hour of daylight left. I rode 33 miles with 3,500 feet of elevation gain. I am now camped at 10,000 feet, 5 miles Northwest of Taylor Reservior." "I woke up exited to get on the Alpine Trail to join the Colordao Trail. The trail quickly became too steep and rocky to ride. After 5 hours pf pushing my bike up every hill, I was done with the trail. I rode down Texas Ridge trail and then connected jeep roads ro get to Tincup Pass road. I rode through Tincup and I am now camped at 11,600 feet just below Tincup Pass. I rode 40 miles and climbed 5,700 feet in almost 10 hours of riding. At this rate I will run out of food before I reach Silverton. My phone does not charge when I ride in the woods so I may no longer be able to keep track of mileage and elevation. At this point the outcome of the trip is iffy. If I run out of food I will have to take a road to the nearest town but there are not many of them." "After crossing Tincup Pass early and descending the very rocky jeep road, I turned on to Tunnel Lake trail. This single track trail had a very nicely graded switchback climb to 12,000. The trail stayed high crossing an alpine basin and crossed two 12,000 foot + passes within less than a mile. I then descended an old railroad grade to Hancock Lake road. The road turned in to a trail and I quickly found myself pushing my bike up a steep and rocky trail over 12,250 foot Chalk Creek Pass. Another pleasant but rocky descent brought me to the Hunt Lake trailhead at 10,542 feet. I spent the next 3 hours pushing my bike up a relentlesly steep and rocky trail. I reached an alpine tarn at 12,000 feet at 4:00pm. I could see virga in the distance and the wind was picking up. The ridge leading to Monarch Pass was ahead of me. I was concerned I would not have good enough weather to attempt the ridge the next day so I set out for the top. I reached the top of the ridge at 12,500 feet just before 5:00pm. Once I was past some more walking over rough trail, there were miles of smooth, fast singletrack leading to Monarch ski area. I've never ridden anything like it in my life. I reached Monarch pass just after 6:00pm and set up my tent behind a CDOT sand storage building. I will get a few supplies at the shop at the top of the pass when they open at 8:00 tomorrow morning. It has started raining now and it could easily turn to snow. I'll see what tomorrow brings. I don't know how many miles I rode today because I had to turn Motion X off to avoid killing my phone. I'll be able to piece it together later using the data book because my entire route today has been on the Colorado Trail." "Camped at Monarch pass last night. Rained/ snowed all night. Started riding again at 9:30 this morning. This trip is going to take longer than I thought. Can't send photos until I get better service." "Riding on Monarch Crest yesterday was fast until Silver Creek, then it got steep, rocky, muddy. Progress has been slower than I planned. There is little water here in the La Garita hills. Camped at a lake at 11,100 last night. Once I leave the singletrack today after another couple of hours of pushing my bike up the hills, I will be on roads for the La Garita Wilderness diversion. Because of low food and being tired, I may ride off of Slumgullion pass to Lake City and then Cinnamon pass to Silverton. This trip is no longer going as planned. I got some food from a guy who was hiking out last night. You can post if you want but this is no longer a Colorado Trail ride. I just have to get back to my truck in Durango which will take at least 3 days even leaving the route." "After finishing up the challenging La Garita hills, the trail turned to smooth and nicely graded single track to the top of Cochetopa pass. From there I rode most of the La Garita Wilderness bike detour on well maintained dirt roads. There was significant elevation gain but nothing like what I have been riding. I camped just below the top of Los Pinos pass at about 10,000 feet. Unless I find food in a tiny town called Cathedral, I will descend from Slumgullion pass on highway 149 in to Lake City. My plan is to continue to Silverton the next morning over 12,600+ foot Cinnamon pass 4x4 route. At least it won't be as dusty because we have had quite a bit of rain." "Today I rode 31 miles on road 788 and highway 149 from just below Los Pinos pass to Lake City. The route was mostly on dirt except for the last 9 miles descending on highway 149. I crossed 10,500 Los Pinos pass then descended to 9,000 feet before climbing 11,530 foot Slumgullion Pass. It would have been a not too difficult half day of riding except that the weather hit and it hit hard. I started riding at 8:00 in a drizzle that turned in to a contionuous rain with the temprature dropping fast. The road I was on became muddy and soon I was riding 2 gears lower than usual because of the mud. By the time I reached highway 149 my hands and feet were cold and I had 9 miles and 2,700 feet of 7% paved descent ahead of me. It was now snowing. It was a cold but short descent and that is probably the fastest that bike has ever gone. I got a cabin for the night when I got to Lake City, took a shower and washed most of my clothes in the sink. All of my stuff is drying out. I mailed home the four maps I crossed after Crested Butte. It's just as well that I had to drop down here to resupply because the Colorado Trail stays between 12,000 and 13,000 feet between Spring Creek pass and Silverton. I am sure there is quite a bit of snow at that elevation. I may even have to let Cinnamon pass dry out and melt off for a day before it is passable. The weather looks good for the rest of the week and I plan to ride from Molas pass to Durango on the Colorado Trail after reaching Silverton." "Today I rode from Lake City to Silverton over 12,640 foot Cinnamon Pass. I'm glad I took a day off in Lake City because if there were much more snow on that road I would have had to walk over the top. The snow had packed down and turned to ice in spots. A man on a heavily loaded touring motorcycle lost control of his bike at the top it tipped over. He took the bags off and I helped him pick it up. I am worried because he never passed me on the way down. If you are going to ride Cinnamon Pass, do it from Lake City, the Silverton side is steeper and rougher. The distance for today's ride was 40 miles with 4,255 feet of elevation gain. I have a tent site at a campground in Silverton tonight. I left myself a box of food at this campground. I will now have plenty of food for the rest of the trip. Tomorrow I will ride highway 550 for 7 miles with a 2000 foot climb to the top of Molas pass where the Colorado Trail singletrack continues to Durango." "I woke up in Silverton with everthing covered in 1/8 inch long ice crystals. There was a heavy dew as the temprature dropped below freezing. The thing that concerned me is that the back of my throat was sore and I was tired even though I slept well. I decided I would see how I felt at the top of Molas pass. I left at 8:30 and reached the top of Molas pass at 10:00. The trail from Molas to Durango is one of the smoothest and fastest sections. I decided to try the trail and if I started to feel worse I could descend on roads leading to Purgatory or Durango every 20 miles or so. What I found on the trail was mud and lots of it. I was pushing hard on the flat sections to move through the mud. On hills my rear tire lost traction and I had to walk up even moderate grades. I struggled through the mud for an hour and reached the first high point at 11,500 feet. The higher I climbed the worse the snow and mud got and within the next several miles the route would climb to 12,500 feet. At this point I decided to ride highway 550 to Durango because I was getting sick and the trail conditions were bad. Experience has taught me that continuing to go hard when you are sick can make it worse fast. I rode 68 miles with 4,237 feet of elevation gain and a whoping 6,912 feet of elevation loss. I reached my truck just before 5:00 PM. In 10 days of riding I covered 414 miles with 44,753 feet of climbing. The leaves and scenery were beautiful and I learned some lessons for future trips."